Mr. Yoshifumi Sato won the Department of Physics Award 2018. Seminar page will be weekly updated. Replace _@_ by @ when using the e-mail address. Artificial periodic structures with a pich of the order of light-wavelength can have very distinct light response compared to that of the constituent materials. 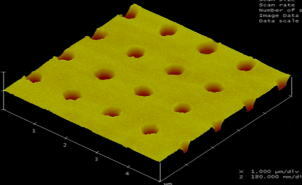 In case the period is so small that the composit can be treated as an effective medium, it is called a metamaterial. If the structure is appropriately designed, it may exhibit such an extraordinary response as negative refractive index that can be never realized in the materials in nature. In case the period is larger than the wavelength of light, the composite is referred to as a photonic crystal where the diffraction is essential in the electromagnetic response. Left： perforated Au thin film fabricated by electron-beam lithography　Right： Periodic structure with asymmetric unit cell. Organic materials with conjugated p-electrons have much interests because they are model compounds of low-dimensional systems. Moreover, they make higher order structures. For example, LH2 complex in bacterial photosynthesis (Left Figure) has a beautiful ring structure. A carbon nanotube can encapsulate other molecules (Center Figure). We are investigating ultrafast dynamics in the complex systems to find new optical functions. 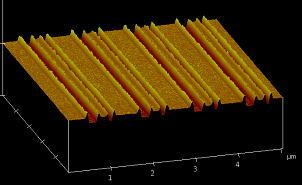 We are developing femtosecond spectroscopies to measure ultrafast phenomena in the conjugated p-electron systems. Using tunable multi pulses, a proper state in the material can be selectively excited by linear and nonlinear photoexcitation. The dynamics following the excitation are measured using femtosecond absorption, fluorescence, and Raman spectroscopies. Copyright (c) Solid State Photo-Physics Group, Department of Physics, Tohoku University. All rights reserved.